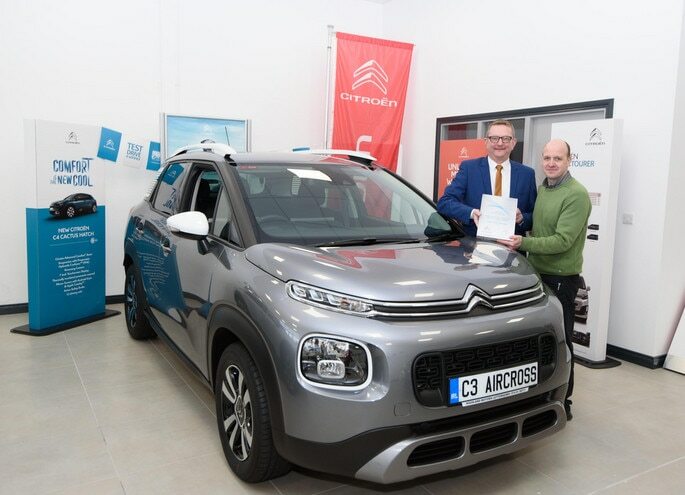 Highland Motors has been crowned the Citroën Ireland Aftersales Dealer of the Year for 2018, from a network of 23 authorised sales dealerships nationwide. Highland Motors was founded by Lawrence Harrigan Senior in 1973 and was appointed a Citroën Dealership in 2013. The state-of-the-art showroom in Letterkenny carries the full Citroën vehicle range and the experienced sales and aftersales team possess a wealth of knowledge and customers satisfaction is a priority. All departments strive to provide the best customer service which is of paramount importance to customers. Pictured at the presentation is (l-r): Mark Carey, Sales Manager, Highland Motors and Emmett McGuckian, Aftersales Manager, Highland Motors.